The internecine row that is ripping apart Real Madrid but providing great entertainment for the rest of the football world, continues to show no sign of resolution. In fact, if anything, positions are becoming more entrenched. 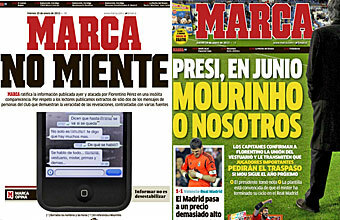 Marca, somewhat gleefully, it has to be said, had reported of a contingent of players, led by skipper Iker Casillas and fellow Spanish international Sergio Ramos, warning club president, Florentine Perez, that either coach Jose Mourinho goes, or they go. Even by the standards of Mourinho’s eventful tenure at the Bernabeu, this was uncharted water. Perez responded yesterday by denying the report – what else could he say? – and now Casillas and Ramos have issued a statement (see below) rubbishing the claims. But again, what else could they do? 1. That in the meeting held on Tuesday with the club’s President and Director General there was no ultimatum from us regarding our coach. 2. As squad captains and members of an excellent group of people and professionals we categorically reject the use of our names or any of the rest of our squad in support of any such information that we label in its entirety as false. 3. We want to show our support for our coach, Jose Mourinho, for whom we have the greatest respect. 4. Finally, we wish to convey to all Real Madrid club members and followers our unwavering conviction that only through the unity of everyone connected with Real Madrid will we overcome, as always, all of the challenges that we face each season. That, one would have thought, would have been the end of the matter, but no, Marca was having none of it and the newspaper responded today with the headline: Marca No Miente (Marca does not lie). Also included was a screenshot of a mobile phone showing the text messages sent allegedly sent to the publication by the rebellious, though unnamed, player. The full piece, detailing the meeting held between the players and Perez, can be found here. Barcelona will meet Real Madrid in the semi-finals of the Spanish Cup following a 6-4 aggregate win over Malaga in the quarter-finals. Surprisingly, it’s only the 7th time the sides have met at this stage. It just seems more because the sides generally manage to meet each other about 12 times a season and every encounter tends to preceded by weeks of speculation and each incident, however trivial, tends to receive the kind of analysis scrutiny usually reserved for the Turin Shroud or rocks from Mars. 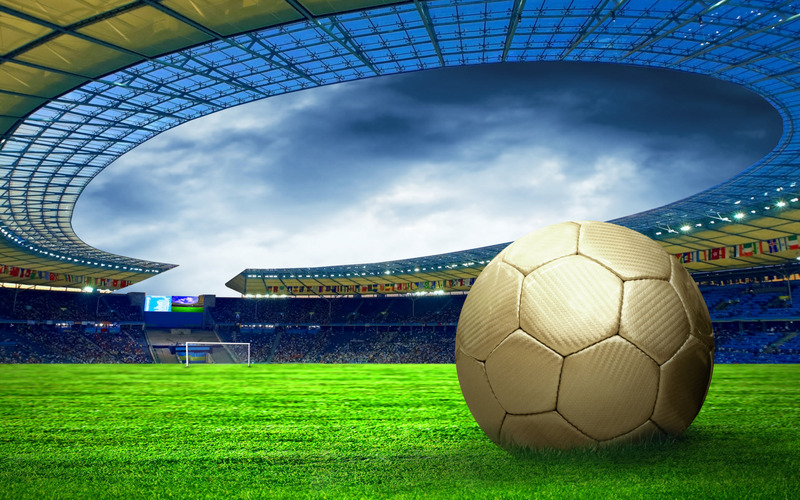 There are times when it seems that the continuation of the rivalry between the two clubs is the only thing sustaining interest in Spanish football. When one reads the list of Liga clubs threatened with bankruptcy and notes that no other Spanish club made it into the top 20 of the Deloitte’s richest club list, one can’t help but wonder whether all this focus on el clasico is detrimental to the league as a whole. Amazing piece of athleticism from Ariel Rojas as he scores with an overhead kick for River Plate against Racing. Discussing the signing of Crystal Palace striker Wilfried Zaha, Sir Alex Ferguson confirms that even though Manchester United no longer produces players of potential, the cheque book is always there if they need to procure those nurtured by other clubs. Liverpool boss Brendan Rodgers has waded into the debate about Eden Hazard’s contretemps with the ballboy during Chelsea’s goalless draw with Swansea on Wednesday. Rodgers, a former manager at Swansea, remembers the ballboy from his time at the Liberty Stadium, and perhaps it was this familiarity that influenced his thoughts on the recent controversy. If Suarez is understanding of where Rodgers is coming from, he may be the only one who is. While Rodgers backed the ballboy, Hazard has received plenty of sympathy from Premier League managers and players who have criticised the ballboy for time-wasting. Queens Park Rangers manager Harry Redknapp said Hazard never intended to kick the ballboy and thought he had made contact with the ball rather than him. “He hasn’t kicked the boy, he toe-poked the ball under the boy’s body,” Redknapp told a news conference on Friday. “Why is the kid lying on the ball in the first place? Imagine the frustration, you’re the player trying to get to a cup final and there’s this kid behaving like an idiot lying on the ball, won’t give the ball back. Arsenal manager Arsene Wenger was another who thought Hazard’s actions were understandable. “Ballboys are there to get the ball quickly back to the players and into the game, they are not there to waste time,” he said. Nice to see some snowdrops of common sense pushing their way through at this time of year. Say what you like about Sepp Blatter but the FIFA president could never be accused of lacking a sense of humour. It was a little over a year ago that Blatter’s proposed solution for players being racially abused was an old fashioned handshake at the end of the game. And, lest we forget his immediate response to the Italian match fixing scandal. “I could understand it if it had happened in Africa, but not in Italy,” he said. Fast forward 14 months from his handshake remarks, and Blatter, a man utterly without shame or principle, has realised that the issue of racism can no longer be brushed under the carpet. Never underestimate his powers of reinvention.When FIFA was mired in allegations of corruption which he spent years ignoring, it was he who created an Ethics Committee to root out the wrongdoing of those who have crossed him. So there we have it: Blatter scourge of the corrupt and now at the vanguard of the fight against racism. What can we expect next week? Well, it wasn’t so long ago that he advised gay fans to keep a low profile during the Qatar World Cup in 2022. Gay rights activist, anyone? Reading winger Jimmy Kebe has mocked Newcastle United’s recent influx of French players by joking tha he was also on his way to St James’ Park. Alan Pardew’s side (or Alan Depardew, as some wag suggested) have already made three signings from Ligue 1 this January and now have 11 francophone players in the first-team squad. 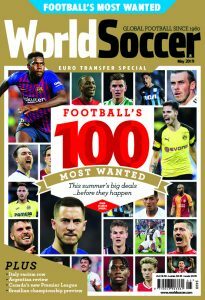 More are reported to be on their way, amid claims that Massaido Haidara and Moussa Sissoko are close to joining the club. Just days after arriving in Turkey, Wesley Sneijder has revealed he already feels at home in country. The Dutch midfielder made the move to Galatasaray from Inter this week in a €7.5 million switch, and spoke of his excitement to get started with his new team. “Such an amazing welcome message could only be seen here,” he told Galatasaray TV. “My wife Yolanthe said, ‘Yes, we have absolutely made the right decision’. It’s been three days so far for Sneijder. How long before his ‘end my Turkey hell’? Santos chairman Luis Alvaro says talks are underway with Neymar regarding a new deal which would keep him at the club beyond 2014. The 20-year-old is tops the wanted list of just about every member of Europe’s elite, but so far he has shown a refreshing imperviousness to the euros, pounds and roubles being dangled in front of him. Speaking to Brazilian reporters, Alvaro claimed the South American footballer of the year could be staying put. “We are already talking about the chance of getting a new deal for him and it is a dream of mine to keep him here,” Alvaro said. Neymar refused to reveal the details of the talks between him and Santos. “I have another year-and-a-half left in my contract, so I’ll keep quiet. But yes, there are talks,” he said. spoken like a man who knows that he will soon be on his way.